Blue and gold organic | Stand, spray and deliver. 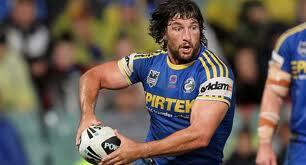 Nathan Hindmarsh has always been there. Always there with an inspirational carry or to run a bullocking line. Always there in the guts to mop up in defence like a tireless janitor. Always there to cut through disinfected verbal bulldust with a countrified line that is soaked to the bone in honesty. Say it ain’t so Hindy; I just imagined you would be pushing your big tractor engine to it’s threshold for eternity. That you would always be stationed out on the fringe and tackling like a programmed appliance until the day our great game died. Gloomy eyes were the flavour of the day when we were informed that the flailing mane and bucket-arse will leave the stage permanently at the close of business in 2012, his departure continuing the steady erosion of colour in the game’s characters. It’s hard to believe that his universal respect could rise to greater heights, but more polish was added to his brand yesterday when he threw himself on the grenade of speculation by announcing his retirement just as the murmurs of the scribes were growing louder. It was not done for the fanfare or a well-deserved backslap; he just wanted to nullify any possible distraction to the playing group by nipping it in the bud. A more selfless and humble team man you would go a long way to find. Hindmarsh is blue and gold organic as it gets. He arrived at the club from Robertson at 16 and hit the top grade in 1998, immediately becoming part of the furniture and building a reputation on an industrious work ethic. From day one, he played like a man infatuated; seemingly driven by the paranoia of guaranteeing he squeezed every possible drop out of the talent gifted to him by the higher powers. It’s glowing praise that he was retained by Brian Smith in the years at Parramatta when the coach was habitually purging fine cattle. Brian had some screwball formula for his approach at the time, but Hindmarsh was the exception. He was just way too good to let loose. He was a destructive ball-runner in the primary stages of his career, but his name was really elevated into the bracket of the elite when he began fulfilling the defensive obligations of up to 3 extra players per match. Hindmarsh redefined what was required as a tackle-bag backrower. Who can forget the image of him hurling up his innards in State of Origin on the back of making a gazillion tackles in one half of football? 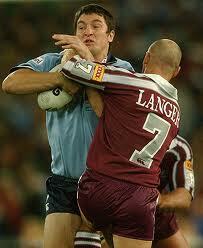 He was the closest thing the Blues had to a Queenslander in their side for years. One of the larger bones I have to pick with the footy gods is the fact that Hindy will depart the game without tasting the rewarding nectar of premiership success, unless there is a divine miracle this year. It seems almost cruel that he was a combatant in 2 of the more unusual losing grand final tales. He was a shortly cropped participant in 2001 when the club’s name was all but engraved on the trophy after a season of record-breaking blue chip performances, only to be ambushed by the Knights. Then he returned to the big dance as the old hand in 2009 as part of a dreamy charge from the backwaters to the decider before being outmuscled by a team who were later discovered to be fudging the numbers. For a man who holds the joint record for most tackles in a game (75 with Shaun Fensom) and who has strained for over 10,000 in total, it’s an unsympathetic and heartless deck of cards he’s been dealt by the spectres who determine the bounce of the Steeden. But despite this, he has trucked on without respite. 310 games into an outstanding stint, he’s still playing like he’s got something to prove. Always chasing down a winger after a line break. Always diving on a loose ball. Always taking responsibility for the losses. But only until the end of 2012. Hindy is the last of the old breed I read in the SMH the other day, and they are not wrong. Hindy never lost where he came from, this guy was a country boy right to the morrow. He kept his hair ugly true, at a time when every other clown was putting gel, peroxide and mowhawks into theirs. He was a gladiator from yesteryear; Ray Price would have been proud to have played along side him. It is cruel that a bloke himself will never taste the desert mouth or belting headache delivered from a mad Monday following a Grand Final win. Gallon may well face the same prospect. He’s the modern day ET except he doesn’t shag his mate’s missus. Agree with the sentiments – very unlucky to be overlooked for reps in recent years too – especially when the Blues needed tacklers and tireless workhorses to help Gallen. That SMH piece on the backrowers seemed pretty on the money too. Mr Eldridge, love to read a piece on ET at some point. Haha! Cheers lads. Perhaps a piece about footy’s loverats…? Ha, Ha! yeah I too want to see a piece about ET as well. You could also throw in a dash about Wayne Carrey, just spice things up.